The Folgefonn Centre in Rosendal, a two hour boat ride South East of Bergen, was the base of nine ice2ice PhD students from Bergen and Copenhagen for four days in late January. They set out to engage in a dialogue with different audiences to improve their science communication skills. 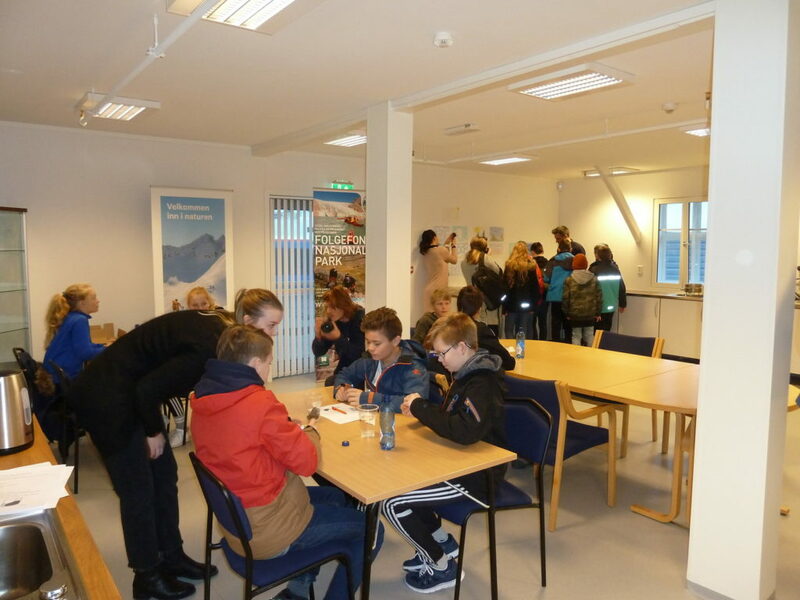 The PhD students formed groups of two to three and aimed to find out what 12 to 13 year-old children from Omvikdalen barneskule and 16-year old teenagers from Kvinnherad vidaregåande skule want to learn about the local and global climate. A third group met tour guides and representatives of the local turistforening. On Monday the groups visited their individual audiences. Kartia and Sunniva, the elementary school group, asked the children what they would like to know about climate change and asked them to draw pictures regarding climate. Many of the children drew the local Folgefonna glacier and sea ice and were very interested in sea level rise. The children got a sneak peek into the daily life of a climate scientist by working with a microscope and running a simple climate model. Anaïs, Eva, and Ida, the high school group, chose a different approach. The teenagers were asked to write down words that came to their mind when they think about local climate, global climate and climate change. Silje and Jonathan presented the idea behind the “Turspor”-project to tour guides and the local turistforening. “Turspor” is an outreach project of the University of Bergen that provides descriptions of local landscapes and their development for hiking trails. But getting to know their audience was only the first step. The PhD students were going to meet their audiences again the following Thursday. So they had two days to work out how they would answer the questions of their audiences. Thursday was a busy day at the Folgefonn Centre. First the high school children came. 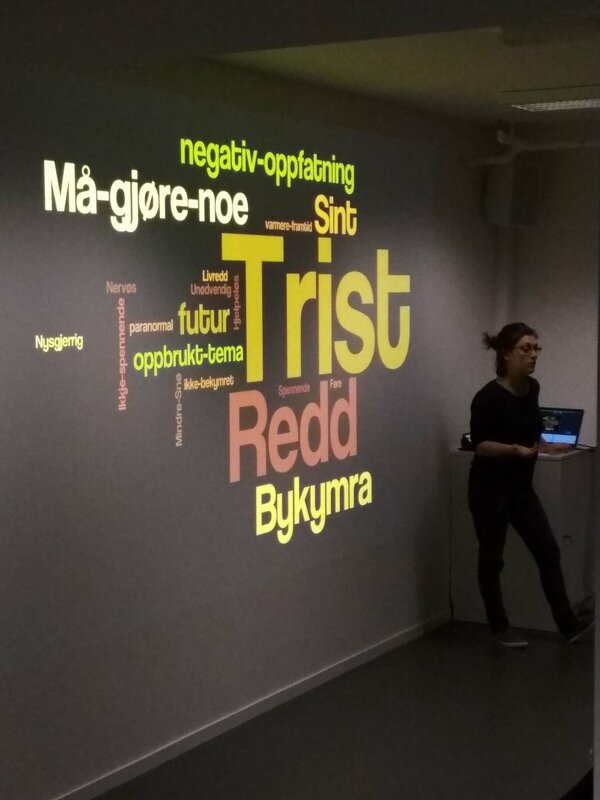 Anaïs, Eva, and Ida started with the whole group and presented word clouds of what the teenagers wrote down on Monday. Then the three PhD students discussed different aspects of their common theme “ice melting” in individual groups. Anaïs explained stratification of the ocean and illustrated it with an experiment. Eva talked about how she is reconstructing past climate changes with the help of marine sediment cores. And Ida focused on the change of Arctic sea ice from a modeling perspective and how it might influence the local climate. The elementary school children came to the Centre shortly after. Karita and Sunniva answered the children’s questions in a card game where the children had to match their questions and Karita’s and Sunniva’s answers. The children got excited about investigating a sediment core from the Arctic Ocean and seeing an experiment illustrating the difference between melting sea and land ice. In the afternoon, Silje and Jonathan presented their interpretation of the development of local landforms and how they plan to write up a “Turspor” as an addition for a local hike trail project in Rosendal. In the end everybody was happy, audiences and PhD students alike. It was a great week where all of us learned a lot. We thank everybody involved for their efforts, and especially Mathew Stiller-Reeve for his enthusiasm and support in the planning phase and during the bootcamp week. He also gave a great lecture with tips on writing skills. Furthermore, we want to thank Ellen Viste for her very nice lecture on presentation techniques. But the whole week would not have been possible without the dedicated teachers at the local schools and especially the employees of the Folgefonn Centre, Karen Løvfall Våge and Ivar Baste. Science communication works best when you initiate a dialogue with your audience to make sure that you really address relevant topics. Go out and talk to your audience :-)! ice2ice all staff 2018- Synergies!